Are you planning a vacation in Egypt and wondering where to stay? 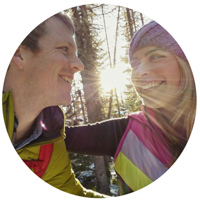 We had the opportunity to stay in the best of the best during our trip so that we could review them for you thoroughly. 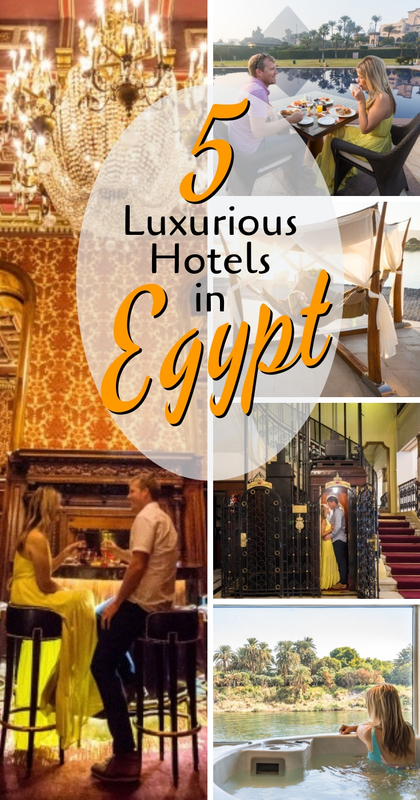 Check out our list of the most luxurious hotels in the main tourist destinations in Egypt! Delectable breakfast buffet goes to the Hilton Luxor! Spectacular views goes to the Mena House Hotel! 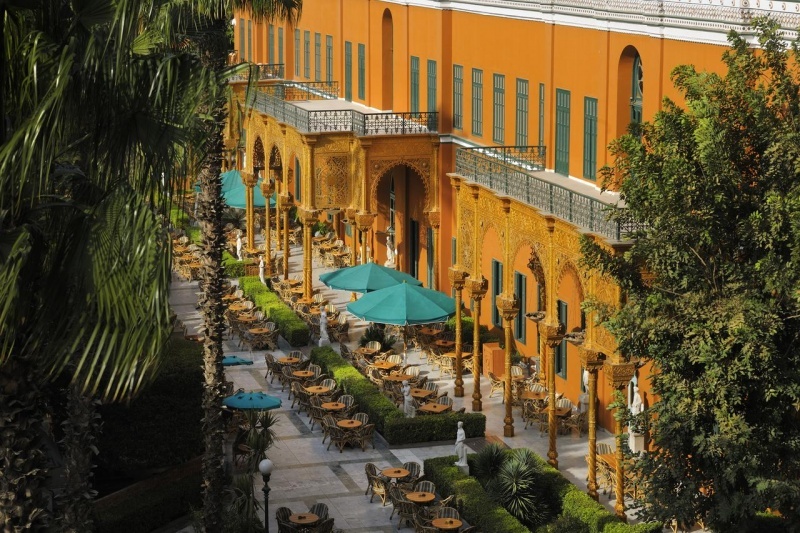 Stunning architecture goes to the Cairo Marriott! Overall luxurious experience goes to the Sonesta Star Goddess Cruise! Views of the sea goes to the Steigenberger Cecil Hotel! The Royal Palace Al Gezira on Zamalek Island was once the opulent guest palace of Khedive Ismail, the ruler of Egypt. Built in 1869 with a price tag of 3/4 of a million Egyptian pounds, the palace housed European monarchs that ventured to Cairo for Suez Canal inauguration celebrations. Intricate golden latticework, massive formal ballrooms, impressive staircases, and gorgeous artwork added lavish touches to the neoclassical architecture style palace. 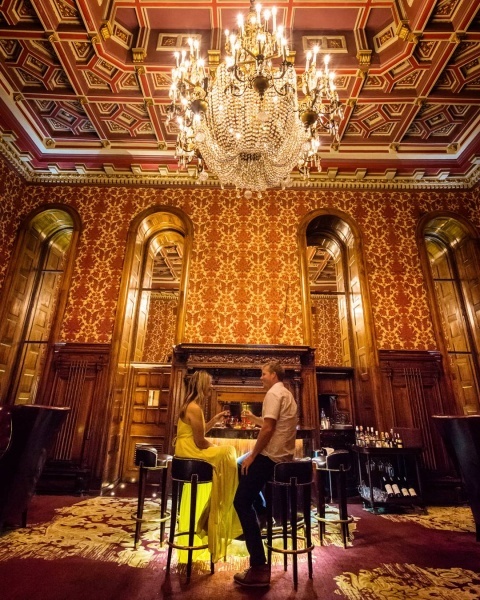 Khedive Ismail is long gone but his palace remains as the Cairo Marriott Hotel where guests from all over the world can enjoy this palace as much as he and his royal guests once did. 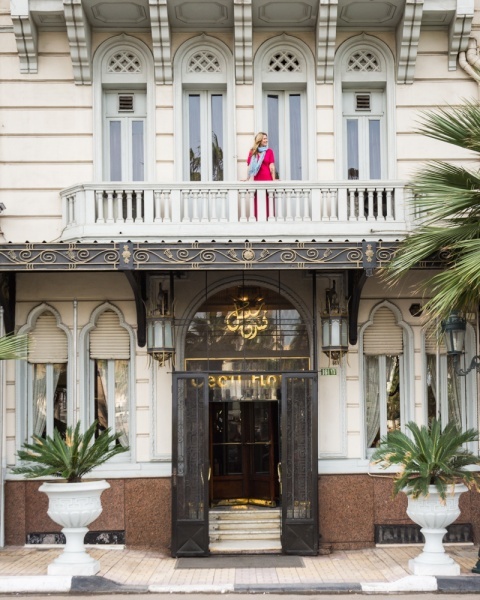 The Marriott gained management of the property in the 1970’s and went to work in restoring the palace to its original splendor while adding modern luxuries to ensure that your stay is absolutely perfect! Saraya Gallery – if the interior design of this spectacular restaurant isn’t enough to dazzle your senses, the savory dishes and the relaxing piano serenade certainly will. This restaurant is not-to-be-missed during your stay at the Cairo Marriott! JW’s Steakhouse – Cairo’s most upscale steakhouse offers the finest cuts of beef surrounded by gorgeous decor while the staff attends to your every desire. Ristorante Tuscany – delicious meats and seafood await you at this delicious Italian favorite. You’ll forget you’re in Egypt! Torii – if you have a hankering for sushi, you’ve come to the right place! Offering “all you can eat” promotions on Mondays and Fridays as well as a Teppanyaki station, this spot will satisfy your craving. Egyptian Nights – offering authentic Egyptian food, nightly entertainment, and shisha, this is the perfect late night hangout. Roy’s – if you’re missing your good old American home cooking, you’re in luck! Roy’s is an American-style bistro offering a mouth-watering lunch buffet and a fresh salad bar! The Bakery – freshly baked breads and pastries as well as coffees and juices are available either on-the-go or in their comfortable seating area. Omar’s Cafe – the incredible breakfast buffet is served here every morning where you’ll find traditional Egyptian dishes, made-to-order omelettes, fresh fruit, a selection of warm breads, decadent desserts, and everything else in-between. Waves – a poolside snack bar that is perfect when hunger strikes while lounging by the gorgeous pool! Garden Promenade Cafe – offering international menu selections in the peace and tranquility of the lush gardens surrounding the hotel, this is the perfect spot to relax and unwind after a morning filled with exploring the city! Harry’s Pub – a lively authentic English pub offering drinks as well as food. Billiard Bar – a small, dark, lavishly decorated bar that is reminiscent of a speakeasy. Perfect for an after-dinner cocktail. Omar Khayyam Casino – the lively onsite casino where you can gamble to your hearts delight! A gorgeous outdoor pool surrounded by lush gardens. A health club offering a sauna and massage services. The only way to really experience the wonder of the Pyramids of Giza is to view them at sunrise and during sunset when they turn hazy and mysterious against the pink sky. And since the gates to the pyramids don’t open until 8:00am and close at 5:00pm, you’ll need a strategic vantage point outside of the Giza plateau. The Mena House Hotel is a 5-star luxury hotel offering spectacular views of they pyramids from the privacy of your own balcony while you sip tea and lounge in your bathrobe! It seems impossible for the views to get any better, but they do. 139 Dining Room & Terrace serves delicious food, a full list of cocktails, and sheesha while overlooking a reflection pool with the Great Pyramid perfectly reflected in the still waters. The Mogul Room – serving up delicious, authentic Indian cuisine in a lavishly decorated setting. Khan el Khalili – the finest Egyptian and Middle Eastern cuisine served in the shadow of the pyramids. 139 All-Day Dining Room & Terrace – a casual dining experience with an outdoor terrace overlooking a reflection pool and the Great Pyramid, this restaurant offers the best views in Giza! The expansive breakfast buffet is served here and they are also open for lunch and dinner. 139 Grill – also offering gorgeous outdoor seating, this restaurant specializes in BBQ and Tandoori specialties. Alfredo – this poolside Italian restaurant serves only the finest farm fresh ingredients in their Italian delicacies. Sultan Lounge – the perfect place to sip a delicious fruity cocktail while gazing out at the pyramids. 139 Lounge Bar & Terrace – offering drinks, sheesha, and snacks, it’s the perfect place to watch sunset. The Hilton Luxor Resort & Spa is the premier luxury hotel along the east bank of the Nile River in Luxor. A spacious, modern room with luxurious plush bedding, a walk-in shower, and all of the amenities you could ever want will make it difficult to get out of bed and leave the resort everyday! The outdoor pool area features a heated infinity pool, comfortable poolside lounge areas and bars – all while soaking in the stunning view of the Nile from the east bank of the river! Rosetta All-Day Dining – the exquisite breakfast buffet is served here every day and you’ll awake every day looking forward to the delicious spread awaiting you. You can also get lunch and dinner specials in this casual setting on the water. Citrus Bar – offering sweet and savory snacks as well as free squeezed juices, teas, and coffee, it’s the perfect spot for a light afternoon snack! Silk Road – this gorgeous restaurant offers popular Indian dishes and yummy Thai curries. Olives – serving lunch and dinner, Olives offers a casual ambiance and both local and Mediterranean dishes. Jannah Tea Bar – you’ll find healthy and delicious teas, juices, smoothies, and seasonal cuisine in the sunny spa courtyard. Sunset Bar & Terrace – the best place to watch the sun setting over the Nile while enjoying a refreshing beverage! Oasis Pool Bar – sip a refreshing cocktail while lounging in a submerged sunbed in the heated pool – you’ll be in heaven! A gorgeous heated infinity pool overlooking the Nile River. A luxurious spa offering professional massage services and relaxing lounge areas. 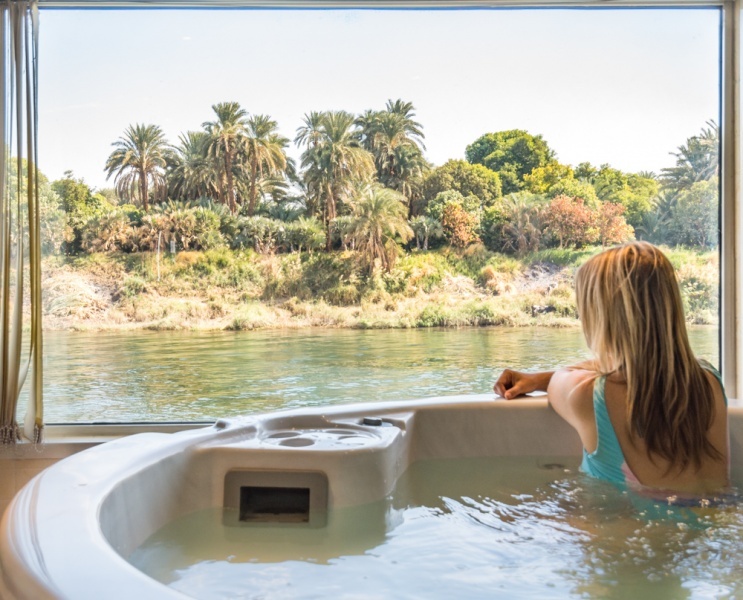 The Sonesta Star Goddess Cruise is the premiere 5-star cruise line that travels up and down the Nile between Luxor and Aswan offering it’s passengers both comfort and class. 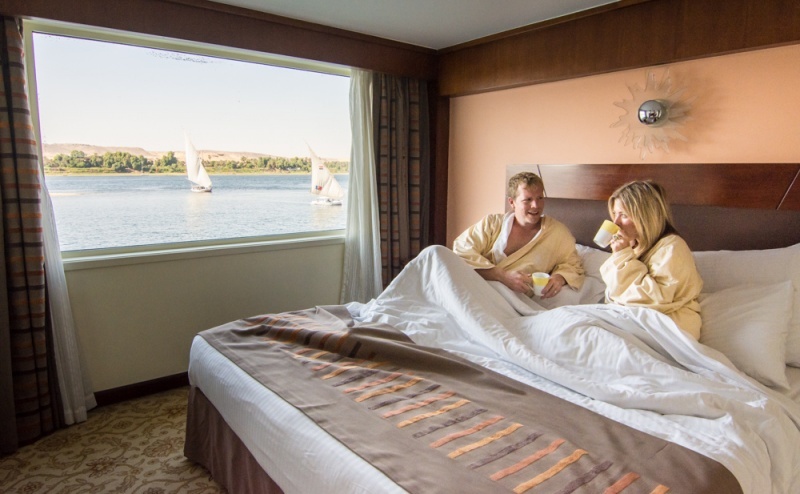 You’ll have a ball relaxing in your gorgeous and spacious suite while gazing at the banks of the Nile every morning. Then stopping along the way to explore ancient temples with your knowledgeable guide. 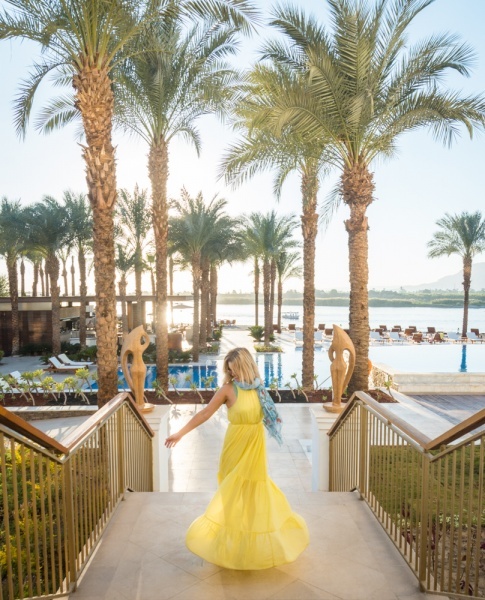 Your evenings will be spent dining on delectable cuisine and then being entertained by the nightly live music and dancing. Main Dining Room – daily breakfast and lunch buffets as well as à la carte dinners. In-suite dining available until midnight. Massage services, sauna and steam bath. Centrally located in the heart of the gorgeous city of Alexandria is the Steigenberger Cecil Hotel. This historic landmark was built in 1929 and offers amazing views of the sea from the spacious and comfortable rooms as well as from the rooftop restaurant. 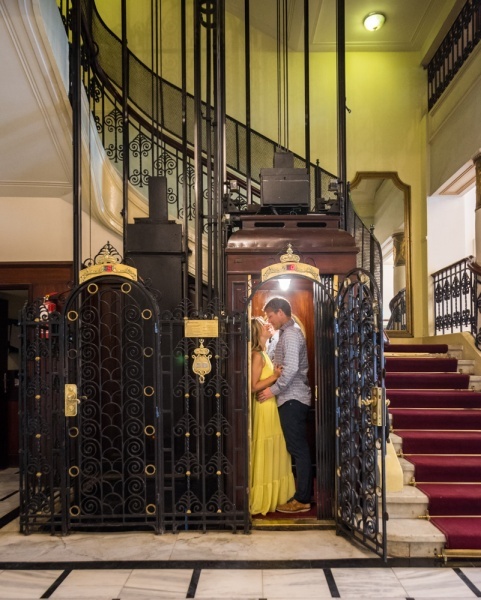 Ornate touches throughout, such as the old-fashioned elevator, the gold chandeliers, and the opulent mirrors remind guests that this hotel has been servicing elite guests for almost 100 years. The super friendly staff at the Cecil will assist you with anything and everything during your stay. Le Jardin – Start every morning with fresh juices, made-to-order omelets, a selection of bread and cheeses, and treats to satisfy your sweet tooth in the Le Jardin Restaurant off the lobby. China House – end your days with a glass of wine on the rooftop of the hotel for amazing views of the sea at sunset. Lobby Café – enjoy snacks, coffee, or tea around the clock daily in this casual atmosphere. Terrace Cafe (open seasonally) – From April to October you can enjoy a drink on the bustling waterfront promenade at the street café. It’s the best spot to enjoy sea views while watching locals wander by. Caesar Palace – dance the night away at the hip happening nightclub on the first floor. 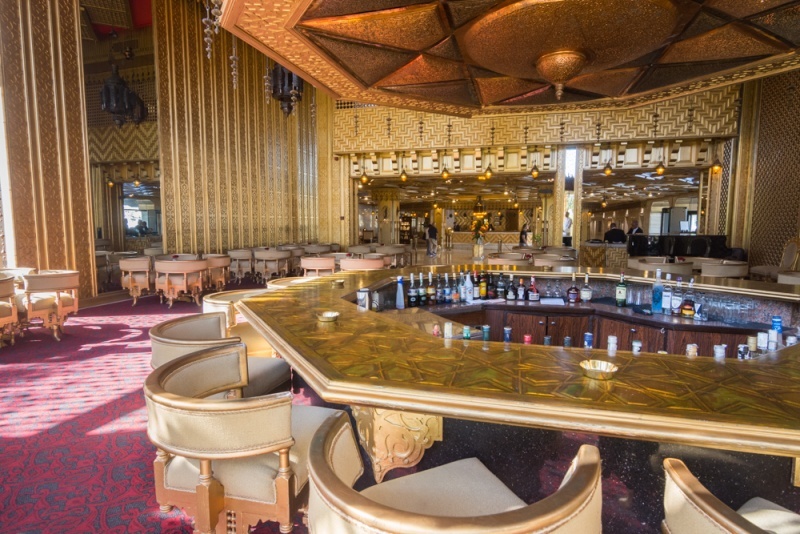 Monty Bar – you’ll find an extensive beverage list as well as evening entertainment in this lively bar! What are you waiting for? 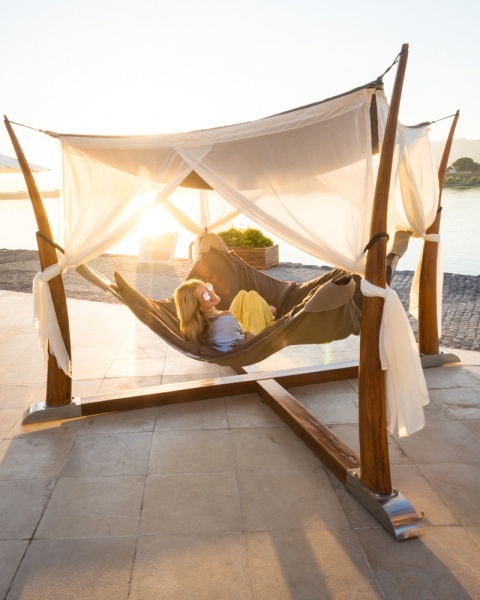 Book your luxurious vacation in the most spectacular hotels in all of Egypt – you deserve it!